Investors should be gravely concerned about the future of their portfolios, according to a newly released report from Bullion Management Group Inc (BMG). The reason? Because today’s fiscal and monetary policies have set the stage for a wrenching period of currency devaluation, portfolio destruction and potentially devastating inflation. “How to Protect Your Portfolio from the Economic Insanity” notes that today’s financial policymakers are displaying a dangerous absence of common sense. The report, authored by noted bullion expert Nick Barisheff, seeks to educate mainstream investors about the powerful but often unnoticed riptides affecting the global economy and, by extension, the health of their portfolios. Beginning with an explanation as to why we are experiencing one financial crisis after another, this report offers investors a carefully researched but easy to understand look at the inner workings of our deeply flawed economy. In doing so, it manages to shed new light on three of the most pressing issues affecting investors today. How investors can protect their portfolios from the inflationary storm. Government debt is already a global problem, but government denial may be the bigger issue. Japan’s debt is already twice its GDP, and will grow even larger in 2010. Britain’s net debt will reach 56 percent of GDP in 2010, while Spain, Italy and Portugal are facing massive fiscal deficits. “Official” US government debt is already 90 percent of GDP, and that number will soar as trillion-dollar budget deficits become the norm for the next several years. Yet little is being done to solve the problem. If America’s fiscal policies aren’t changed, its debt-to-GDP ratio will soon rise to the same level as that of Greece and Portugal. These are extraordinary times. Today, wealth protection is the primary goal. According to the report, precious metals bullion is the one asset class every astute investor must own today. Why? Because it maintains its value under virtually all economic conditions. Most investors confuse money and currency. Gold is money, currency is not. Gold is money because it is a store of value. Currency, whether US or Canadian dollars or euros or rubles or yuan or yen, is losing its value – fast. Currencies are being depreciated at an unprecedented rate because they are being created out of thin air by desperate, deeply indebted governments. The report emphasizes that in today’s economic environment, it is crucial that investors take a new approach. They need to make the shift away from a “currency mindset” to a “gold mindset.” The switch to a gold mindset does not mean investors need to become gold fanatics and convert all their possessions into gold. It means allocating the proper percentage of one’s portfolio to gold and precious metals. And that means understanding the importance of intrinsic (monetary) value versus currency-based value. The report demonstrates that with gold at US$1,400 per ounce, the bullion market remains miniscule compared to the financial assets markets. 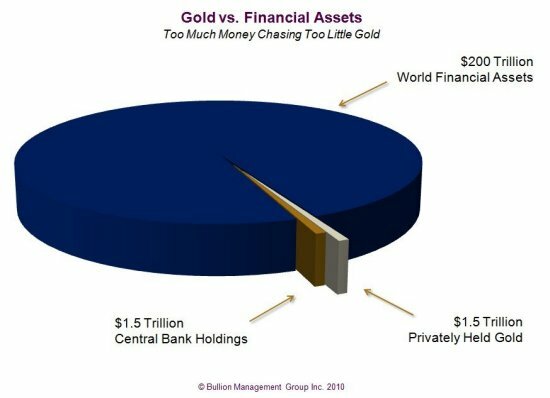 In fact, as the table below shows, privately held gold bullion is valued at but a fraction of total global financial assets. And the total amount of all the gold ever mined, including central bank reserves, industrial applications and jewellery is less than 4 percent of the total value of global stocks and bonds.